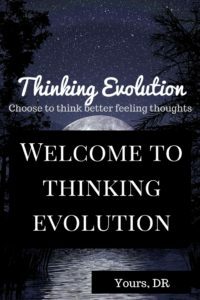 Thinking Evolution – Listen to yourself. Make your voice so loud you can't ignore it- and be a part of a Thinking Evolution. Listen to yourself. Make your voice so loud you can't ignore it- and be a part of a Thinking Evolution. First and foremost. Hello! Whether someone told you about us, or you just randomly stumbled across Thinking Evolution, welcome. I’m glad you found us, I hope you have a look around and see something that interests you. Where are my manners! Let me introduce myself. I’m best known as DR. I know it seems incredibly egotistical of me not to put my name on here, but getting my name “known” around the world is far from I hope to achieve on Thinking Evolution. I hope that we can create a community whose ideas and beliefs of life, love and everything in between are something we hold dear and are something that we can share with each other. Through this, maybe we can learn more about the world and the people who reside here on this big blue and green marble. I hope through doing this we can also learn more about ourselves, who we are and who we want to be. I obviously have a name and what is considered what in our modern world a “normal” life. If normal was defined as living the life you were supposed to live in a world where we are told “this is the way the world is.” This world is the best its going to be and there’s nothing we can do about it- then a normal life is what i occur in, as i’m sure a lot of us do. I have never felt entirely settled by this way of living, the world being on the knife edge as it is a lot of the time, it’s hard to just sit and coast doing only what we are “supposed” to do. We just have to find our place in the world and that is that. I have a job that pays money, a family and friends, all of which I’m very grateful for. The state of the world at the moment is that there are people in much crappier situations than me. As much as I might be grateful for what I have right now, I feel as if there is something that could be done to make life better, to do good, to feel good and maybe help each other understand that while the world isn’t all sunshine and rainbows, we can feel good, feel powerful and are capable of so much more than we think. It’s these feelings I like to believe that gets us through as a thought becomes a movement, a love of positive experiences, of a person that makes you feel like you thought you never could. It is this that makes us who we are and more confident every day of what we want to achieve and more capable of getting to that point. Life is a journey people and each step counts, no matter how small. I hope that, like me, you are curious about the world and the infinite possibilities that are available if you just give yourself the means to go and make that impact on life you always imagined was possible, to share ideas and beliefs and most importantly, understand you always have a choice. They may not be easy choices, the choices may make the goal seem so much further away. Yet these choices make you feel good, for the journey is just as important as the goal. By this, I don’t mean money. My belief is that money is earned to allow us to go and experience the magnificence of the world. So yes, we need to make money, that is a reality of the world we live in, but how we see it could lead to an ultimate evolution on such a grand scale. It could make for a Thinking Evolution, and help us see we can choose to feel better feeling thoughts. I should probably mention i don’t claim to know any more or less than anyone else. I hope to be just as much of a part of this as all of you. I’m along for the ride people. Choose to think better feeling thoughts. And start your Thinking Evolution. I look forward to hearing from you. Welcome! PS: General legal note so I don’t get sued: I do not own any of the images or videos posted on this site and they will not be claimed as such. Anything I say is based on my own opinion and the opinions of those who wish to join the discussion and find their own Thinking Evolution.